We strongly believe that the more families know about the youth mental health crisis, the better decisions they can make. Just like the anti-drug and anti-smoking campaigns of years past, we are going to need a huge societal shift, and we want to start it right here in the South Bay and Long Beach. We kicked off our community-wide education and awareness campaign in October 2018 when we hosted our first major community event focused on youth mental health. You can learn more about that event and the activities that followed below. For our first major public youth mental health-related event, we hosted an evening with nationally-renowned author and psychology professor Dr. Jean Twenge in October 2018, in partnership with Torrance Unified School District and South Bay Families Connected, where she shared her groundbreaking research on screen time and mental health with local families. Before the presentation, we hosted a Special Reception for community leaders and those who have played an integral role in our work over the past year. It was truly gratifying to hear Dr. Twenge - who we have quoted in countless conversations - confirm that we are headed in the right direction. She then delivered an engaging presentation, including eye-opening data from her research on "iGen" and practical tips to counter the effects of screens on teens, which were in line with the services we are currently developing. Some of the key takeaways from Dr. Twenge's speech included the fact that teens need 9-10 hours of sleep a night, but most get 4-5; their body's circadian rhythm makes it hard for them to go to sleep before 11pm, which makes getting up early for school equally difficult; and most importantly, they should avoid blue light from screens at night, including no screens in the bedrooms. Click here to see more photos from the event on Facebook. In December 2018 and January 2019, we collaborated with partners working at the forefront by participating in Beach Cities Health District's Partnership for Youth Coalition as a member of the Student Mental Health Provider Task Force, speaking to members of Youth Leadership Long Beach about screen time and social media at their class on Human Relations and Social Justice, and moderating a panel on the Youth Suicide Crisis at the California Purchasers Health Care Coalition (CPHCC) 2019 Conference. We had two great opportunities to speak about our new youth mental health focus at venues in Torrance and Long Beach in late January and early February 2019. 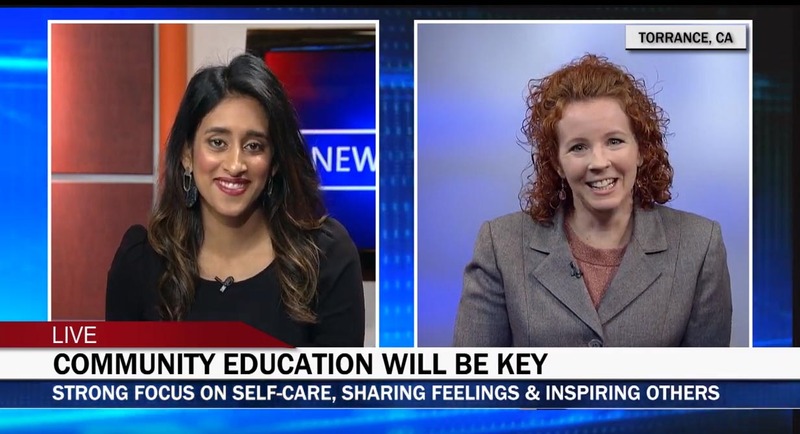 President/CEO Sara Myers was interviewed by Hibah Samad on the February 5 episode of Torrance Citi CABLE's NEWSBREAK LIVE, discussing our research, the community's input, how we plan to help families address screen time and social media addiction, and some helpful resources we can all use now. Click here to watch the interview and learn more. Sara also spoke with seventh- and eighth-graders about the impact of social media and screen time on their mental health at the Young Women's Empowerment Conference in Long Beach. The third-annual, day-long event hosted by Congressman Alan Lowenthal featured women in a range of careers providing career advice, support and guidance to middle-school girls from various parts of Long Beach. Click here to read the Long Beach Post article about the event, including details about the themes discussed in our Screen Time and Social Media breakout session. Click here to see our tweet thanking Lady Gaga and the Born This Way Foundation for this message and everything they do to do promote youth mental and kindness. 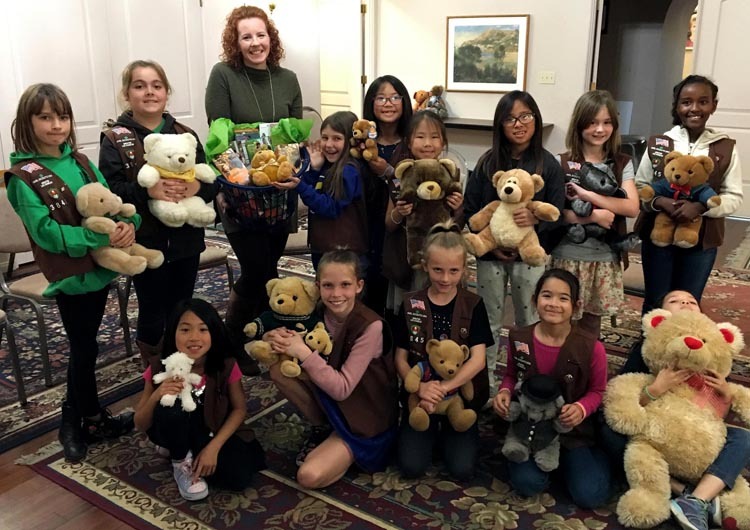 The kind, compassionate and energetic members of Torrance's Girl Scout Troop 3845 visited us in March 2019 to present a basket of donated cookies for our food pantry and a generous check following a successful Girl Scout Cookie season. During their visit, we showed the girls how the Volunteer Center helps local elementary school students their age, and we discussed how the girls can improve their own social-emotional wellness. First, we introduced them to Food For Kids by taking a tour of the pantry and reading a book from our kindness-themed book list ("Maddie's Fridge" by Lois Brandt). Then, we looked at the different items in the Operation Teddy Bear schoolbag and talked about why we provide them to the first graders, followed by a discussion about our feelings and ways we can be kind. We ended on a very empathetic, comforting note as we hugged teddy bears and practiced taking deep breaths. We are so grateful to have such a generous community of youth, and we love when we can have conversations about kindness, compassion and social-emotional wellness! We proudly joined together with the American Foundation for Suicide Prevention (AFSP) and the South Bay Association of School Psychologists to sponsor and participate in the first ever Out of the Darkness South Bay Campus Walk at Torrance High School in March 2019 . More than 200 community members representing 45 teams walked together in remembrance, hope and support of suicide prevention and mental health. The South Bay Campus Walk surpassed its fundraising goal of $10,000 by more than $5,000, which will help fund AFSP's educational programs and services in our community.